When is a door a door that is not a door? When is a door a door that is a door that is not a door? 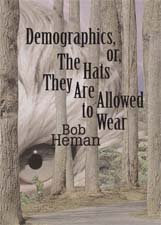 From a distance, Bob Heman’s prose poems in Demographics, or, The Hats They Are Allowed to Wear appear to be neat containers for singular thoughts, descriptions of objects or ideas. Strung together, these containers form a narrative, an allegory, perhaps, of men and forest and animals and ocean and stones, of the beginning or the end of time. In “Containers,” Heman writes, “The container contains what it contains.” This is more than a simple tautology — it is a clue, an urging, for the reader to take a closer look. Within Heman’s taut containers, surfaces start out straightforward, then refract; the natural order of perception subtly shifts. “The cars are placed where the roads are drawn,” “There were wings there waiting for a new animal to hold them down” — these are fervent synecdoches, where the replacement of part for whole disrupts established hierarchies. The guides supersede that which they’re guiding. 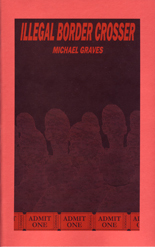 © Quale Press LLC, 2009.